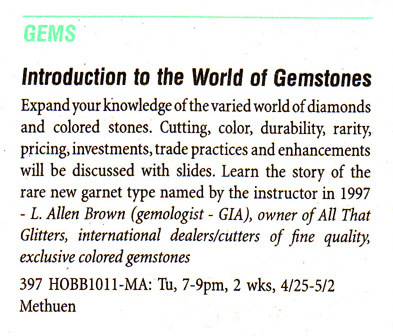 L. Allen Brown/All That Glitters, may be the most published of colored gemstone dealers/businesses, with many gemstones appearing in books, magazines, newspapers, trade journals, and on gem related websites! 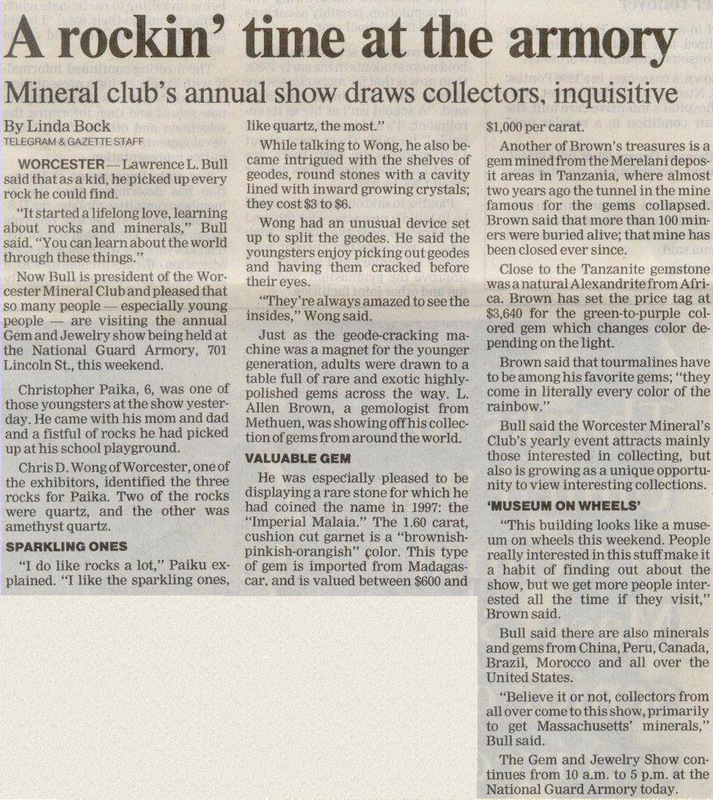 Below are some articles where gemstones from the All That Glitters Collection (inventory) have appeared. For gemstones that have appeared in these articles or published elsewhere, visit our Published Gems page! Gem/Mineral Photograper Jeff Scovil Photographs All That Glitters LARGE Ruby! GIA's Gems & Gemology Magazine Publishes Another All That Glitters One-of-a-Kind Gemstone! GIA studys All That Glitters Unusual Cat's Eye Yellow Beryl. To quote GIA regarding these Unique Gems - "...conducted the analysis and observed some very interesting and unusual inclusions in these heliodor samples...they all have very rare well-formed blue octahedral gahnite crystals (ZnAl2O4, spinel group mineral). The gahnite inclusions have never been reported before in beryl and maybe can be used as a diagnostic inclusion of the geographic origin of the stone after some more detailed research in the future." 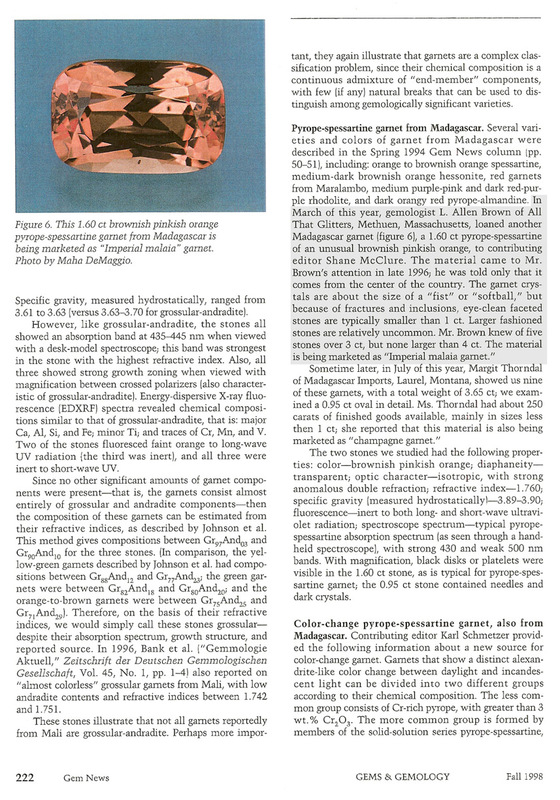 Mystery Revealed... All That Glitters "Rainbow" Scapolite studied by GIA and results in an article in the prestigious Gems and Gemology Magazine (Spring 2015). 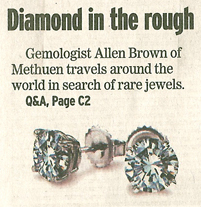 L. Allen Brown, Owner of All That Glitters, is quoted in the article below. Several Corundum(Ruby/Sapphire) photos from the All That Glitters inventory are used as examples. Rapaport Article: New Discovery Same Name? "On occasion, gem enthusiasts come across unusual specimens. It almost always occurs unexpectedly, while browsing the trade show floors or during a chance visit to a gem dealer's office. Sometimes they are presented as new minerals, trying to earn the public recognition. However, from time to time, we see something else - a familiar gem with an unfamiliar property or appearance. These are the one-of-a-kind pieces or collectors' items. Such were the gem specimens we found in L. Allen Brown's bag at the last Tucson show. He is the owner of All That Glitters in Methuen, Massachusetts." Color Change YAG Article - Gemewizard: Gemewizard CC YAG Article. This material has been faceted and you can find it in the All That Glitters Inventory, as well as one piece of rough if it hasn't sold yet! The owner of All That Glitters, Mr. Brown, was recently contacted by an individual who has a blog related to gemstones, and asked whether he would be interested in writing an article for the blog. If one calls it a Bicolor Demantoid, there is more of a likelihood that one would understand what this gem entails; whereas if called a Bicolor or Mulicolored Andradite, most people on the retail side or even within the gem trade, might not have any idea of the gem species involved. It was even certed as a Demantoid from one gem lab - whatever one wishes to call it, it is an oddity and rare. All That Glitters Gemstones and Crystal appear in another Trade Article analyzing a Unique Ametrine showing a 'stepped zone' feature, as well as a nicely saturated 50:50 split Faceted Ametrine and a crystal from the source - the Anahi Mine. Gemstones - Understanding, Identifying and Buying, by Keith Wallis - New! Keith Wallis releases his New edition of "Gemstones - Understanding, Identifying and Buying". There are approximately 35 photos of gemstones from the All That Glitters inventory, that represent their species in the book (this is pretty unprecindented for one book to contain this many photos from one source!). L. Allen Brown/All That Glitters discloses interesting feature of Tanzanite. Most Tanzanite is heated to produce the blue-purple that one expects of Tanzanite. It usually occurs as a brown gemstone and is heated. A few rare pieces are not brown or blue-purple, but green, yellow, pink, teal, etc. Read the story of a green gem undergoing the transformation. All That Glitters - L. Allen Brown.